On Friday, I had the chance to spend some time with Robert Isom, President of American Airlines, when he came to Los Angeles for a town hall meeting. I’ve long known Robert as a people person, ever since my first interaction with him more than 15 years ago when he briefly became my VP in Revenue Management at America West. Having seen him work, it seemed entirely genuine when he asked, “You didn’t come up here just for me, did you?” It’s the same type of concern for people I remember from those long-ago days in Tempe. Naturally, Robert wanted to spend a lot of time talking about people, but of course, I had other things on the mind. Our conversation turned into a 3,000 word transcript, so I’m splitting this up into two days. Today we’ll talk about his agenda when he came in as President two years ago, whether the operation today is where he wants it to be, and what it means to be “the best.” Tomorrow, look for more discussion around how to respond to the increasing price of oil, whether product segmentation has reached a limit, and the value of getting out in the field. I had joked that I would have liked to do the interview in the lavatory on a 737 MAX, but those aren’t in LA yet. I had to settle for a conference room overlooking the alley between Terminals 4 and 5. Robert did, however, want to make it clear that he’s flown the MAX in coach, he likes a lot of the amenities, and he knows it’s going to be a great airplane for American. Now, on to the discussion. your agenda is going to be? How do you decide where you want to take this airline? Robert Isom, President, American Airlines: The cool thing is that we’ve always had a really tight team, since the merger. And Doug [Parker, CEO]’s done a great job of making sure everybody understands that there’s one objective, and that is the company’s goals…. At least for me, I bought in 100 percent, and was a major part of the initiatives going on. We have to look at the big initiatives 2 years ago. They’re still big now because a lot of these things take a long time to implement, but we knew that for American… our strength is in our hubs. And that work we were doing to optimize what we do with our fleet, with our network, and really focusing back on the hubs, that was something that was a continuation [of what was happening previously]. And when you look at what we’re trying to do from a sales and marketing perspective, there’s a lot of effort put into segmentation, trying to identify what customers’ needs are from every end of the spectrum from incredibly price-conscious to those who want every amenity. We’ve pursued that strategy since then, and from what I see, it’s been a gradual but progressive build on the work we laid out before. Cranky: That’s the broader strategy, and of course you were part of that, and from an operations perspective you were already running that. But you replaced someone as president whose wheelhouse was RM [revenue management], that was how he really made his name. So when you get the keys to that side of the business, what do you look at and say “here’s how I want to leave my mark. Here’s how I want to guide this”? Robert: Yeah, we brought in Alison in sales, and Joe Mohan in alliances, so we’ve got everybody at the table. The kind of things we’re able to do now, which have been really advantageous to the company, when we sit down and we talk about “hey, how do you create a schedule?” And a game plan that’s not just paper and theoretical. How do you build one that’s operable as well? That’s part of the reason I like to come out and see what are the fruits of the labor. So where does that end up? It ends up in like, Chicago, which had every single widebody type come through its operation. And you know what? We struggled. So the kind of changes we can make… what’s optimal? What’s best for the airline? So you do things like making Chicago a 787 focus city. And that’s what we’ve done. But those kind of things we really do align around. 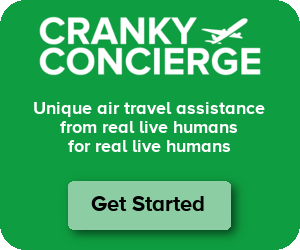 Cranky: So is the operation where you want it to be today? Robert: Oh, no. No, no, but that’s the cool thing. Because for me, in this role, I really think we’re just getting started. There’s a heck of a lot of fun getting everyone aligned…. Getting in and finding the talent we have in the organization and giving them a voice and pushing responsibility down has been one of the things we’ve tried to do over the last couple years. We have the players and the team aligned. The game plan, in terms of what we need to do, strengthening our hubs and continuing to operate where we have a strategic advantage, going further in terms of segmentation, trying to identify what customers want, and what you can do to serve them in a profitable way has been a huge deal. We’re not where we want, but the backlog of things is really pretty cool. You know about basic and premium economy. We’ve talked a lot about basic. Basic isn’t rolled out as extensively as we’d like it yet. Premium economy we only have it installed on I think 60 or 70 percent of the fleet now. But next summer we’ll have it on the 787-8s. That will be done. You know the work we’ve done in sales. They’re making really nice progress in attracting corporate clients. With our frequent flier program, the AAdvantage program, and our co-brand relationship, we’re on track to continue to build the best loyalty program and the best co-brand card in the business. And you know the kind of work we’re doing to enhance the product. You know, Flagship lounges which you’ve probably seen here and all lie-flat seating which was in place last year. And the reconfiguration of our narrowbody fleet is on its path. So I take a look at all of that and think, we’ve made great progress, but we have to continue to execute. We have to get more done. And from an operations perspective, I can’t wait to get to an airline that we can really truly operate as one. That’s coming up this year. Cranky: Is it finally this year? Robert: Our flight attendant integration will be in place. We have some work to do with our association fleet and maintenance where we have to get them on the same contract, but that’s a little different. That’s really not holding us up from doing the kinds of things we want to do with product and schedule. Cranky: You talk about building the best. Etihad tried that. They didn’t have to worry about making money. Obviously the best is a relative thing. You have to figure out how to do that while making money. So how do you evaluate that? I know we’ve seen in the past a lot of benchmarking — not just with American — against Delta. How are you looking at this and global carriers and saying, how do we fit? Robert: Well, we’re starting from a really good spot. We’re the world’s largest carrier, broadest network, and then tie into that with what I think are the best partners. Whether it’s BA in Heathrow or JAL and Cathay and soon a joint business with Qantas, hopefully, and soon with LATAM, and some really nice investment work we’ve made in China Southern. You take American Airlines and you take that network of relationships. We’re starting from a great spot. When you ask “how do you fit in the world?” We’re an incredibly important part of the domestic and international marketplace and will continue to be so. So trying to be the best is something we can all strive for, but what I take a look at is how do we do as much as we can and improve every day with the assets we have. The kind of things we talked about, improving the product, taking care of the team, those are going to move us in the right direction. No doubt, there are potholes along the road, and the economic conditions today warrant making sure we’re incredibly prudent about how we spend money. Come back tomorrow for the second half of my interview. We’ll start with how to respond to the recent run-up in oil prices. Nice puff piece Brett. Why didn’t you ask him specific questions about the management team’s progress on the targets (e.g., labor harmony, operational synergies and cost savings, corporate sales revenue increases, running a better airline, etc.) they used as justification for the merger? The answers to those questions wouldn’t appear to be so rosy. Either Mr. Isom is 5’8″ and 145 lbs or he flew AA in Coach DFW-IAH, because flying 737 MAX is a terrible experience for anyone over 6’0″. And don’t even start on the lav. He said he flew coach. He didn’t say which seat. Perhaps bulkhead or exit row? And was the flight full or did they block the seat next to him. He did now say he flew coach, last row, middle seat. Yeah, and I had to edit down some of the fluff just to get to any kind of point. Sadly, that’s how it often is when talking to big airline bosses these days. You’ll see tomorrow that even when I push harder, I still don’t get much. I pushed 4 times on when the airline decides to start pulling down capacity due to oil prices, and I never got a concrete answer. I doubt they’ll pull down capacity much due to oil prices rising. It’s sort of a game of chicken since everyone benefits when one carrier reduces capacity for any reason. They’re already paying for the planes and so the costs associated with operating a flight are minimal when you take out indirect costs, which makes it a smaller hurdle to hop. Capacity is also one of those things that will move the stock price whenever there is any mention of it going one way or another. Mark – Well, if this is going to be a sustained oil price increase and not just a spike, then they will have to adjust their long term planning. (Short term, I don’t expect change for the reasons you mentioned.) So I was trying to get a feel for how they approach their evaluation. When do they decide that it’s more than a spike so they need to think longer term changes? On the last earnings call, it was mentioned that any capacity cuts would come after the busy summer travel season. The point was made that there’s very little to gain by taking capacity out when demand is at its peak. Come on Cranky. I get that you have great respect for this guy, but this was nothing but PR fluff. Could have been a good podcast episode. I’m 6’1″ and I avoid the MAX (the modern F-100) at all costs. If I can’t find an alternative on AA metal I ring Delta’s doorbell. So for Mr. Isom to be so gun-ho about it is really perplexing unless he sat in the exit row. Try the last row. Same with the other executives. East coast to west coast and then interview them. Disconcerting to me how important the credit cards are to the overall business model. A lot of words being spoken. Not much information being communicated. True. I should have put a TL;DR in here. The Best! Become the Best by accumulating the most Best points by Besting Bester than your Best competitors. Earn Best Bonuses with Best Culture Bonuses, Best Alliance Bonuses and Best D0 Bonuses! Nobody’s gonna out-Best these Bestards! I call BS. Anybody can fly a 737Max or an “Oasis” equipped 738 in the middle seat ONCE. The rest of us will have to do it on a regular basis, and it will be AWFUL! This interview is informative–in the sense that it’s completely not informative. You read about AA making great investments in improving its culture and communicating with its employees. This gives you insight into what those communications must contain. I can imagine the frustration of the employees, having to read stuff like this and not getting any real answers about the customer and operational concerns they must navigate. I think the only piece of real information is that he did get (imagine this!) many of the major players to speak to each other to build something approaching a realistic schedule. What an achievement! Robert’s last response almost cracks me up. Didn’t mention the customer one time. That’s the problem with American and United…. they are so self absorbed with their own progress and self enhancements that they forget who their working for. Wow, what a bunch of authentic frontier gibberish. Pure puff. I know you can only push so far but his answers were so vague as to border on useless. Glad to see that never talks about his customers, only his employees and “team”. This guy is bad news and a total charlatan.